A national campaign will see the Legion asking the public and local authorities to purchase Flanders poppy seeds from B&Q to plant on their own land. The campaign will see the UK awash with poppies during the centenary period in commemoration of all those who lost their lives in WWI. Seeds will be available in B&Q stores from Wednesday 23rd October 2013, throughout 2014 and beyond. Each pack will be sold for £2 with a £1 donation to The Royal British Legion. The funds raised by the campaign will go towards the £1.6million the Legion spends each week on vital care and support to the Armed Forces community. 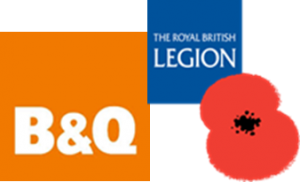 As the national corporate partner for the Centenary Poppy Campaign, B&Q will be working with RBL to launch the partnership and promote the seeds through social media, online promotion and national press.